Military jets have a unique aroma inside them. It’s a curious mix of oil, kerosene, aluminium and hot electrics that comes together to remind the senses of where we are every time we smell it. It’s here today as we step through the rearmost crew door into Nimrod XV250’s darkened interior, leaving the sound of the ground power unit behind as we work our way forwards to the cockpit. Past the rows of sixties cathode ray screens and the large desks of the tactical operators lit by subdued night vision lighting, we wind our way to the cockpit. There’s a high pitched hum running through the aircraft as, plugged into ground power, XV250 has come alive for her Thunder Day engine runs. Our Nimrod was flown from RAF Kinloss to the Museum in fully working condition. Since then she has been tended to by a dedicated team of volunteer engineers to ensure she is kept as close as possible to flying condition. This is no easy task, as military jets in active service are designed to be flown several times each week. They have an army of technicians and spares support to hand, plus the budget of a NATO air force to fund the whole programme. So Why Do We Keep Her Running? The obvious reason is because we all love her and visitors flock to our Thunder Days to hear her engines spinning up at close quarters. But there’s more to it than that. The second reason for XV250’s life here is to serve as a reminder and a memorial to the fourteen military personnel that died over Kandahar, Afghanistan in the tragic accident of 2006, the biggest single loss of life by the military since the Falklands War. Military jets don’t like being parked for long periods. They are constructed from lightweight metals such as aluminium and magnesium and have the bare minimum of corrosion proofing. Parking a high performance jet, even over a long weekend, results in pools of fluid on the floor. Left for longer, metal contracts, the dreaded condensation creeps into the electronics and they quickly start to decline. 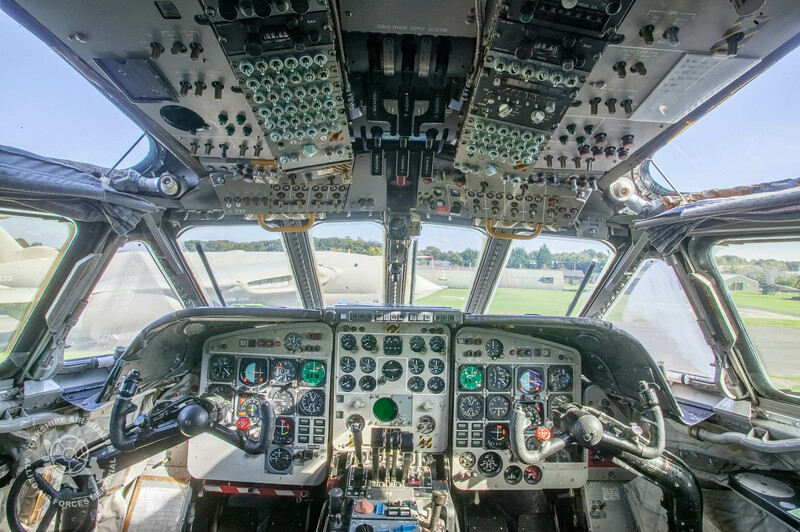 A complex aircraft like the Nimrod, with period electronics and analogue 1960’s and 1970’s technology needs constant attention. To keep her in such excellent condition, with systems that come to life, engines that roar and an interior still full of sixties electronics requires an experience and knowledge that only years of working ‘hands on’ with these machines can give. The engine controls are all analogue, with no computer controls they have to be handled in a certain way to prevent damage. The team looking after XV250 are all experienced military personnel. While some are now retired, others are still working in the Royal Air Force. As well as their day jobs working on the nation’s current aircraft, they give up their spare time to travel to the Museum and tend to XV250. This video, complete with cockpit audio, shows the team running the engines and other systems on a Thunder Day. Many visitors watching on Thunder Days wonder what is happening before the engines start, so here you can see exactly what the procedures are, just as they were performed in service. Keeping XV250 in suspended animation between engine runs while protecting her from the Yorkshire climate takes a lot of work, but if we didn’t she would begin the long slow decline that is often seen at museums where engineless airframes succumb to the European elements. Testimony to the fact that XV250 is still fit and well is borne out by the comments from ex-Nimrod crews who visit from time to time. They are amazed to see her still alive, systems humming away, sounding and even smelling just as if she was preparing to fly out over the North Atlantic hunting submarines, or preparing for one of those long, long surveillance missions over Afghanistan directing ground forces. While her flying days are now over, just like people, XV250’s regular exercise delays the onset of old age. My wife and I were in Britain in June 2015, and spent most of a day at the Yorkshire Air museum. We really enjoyed all the old British aircraft, but unfortunately we were not there on a day when the aircraft were run up as shown n this video. We live in Calgary Alberta Canada, and I as a retired commercial pilot have fond memories of at least one appearance here in Calgary of the magnificent Vulcan at airshow several years ago. This video really brings back some fond memories for me.